As we continue to gear up for Thanksgiving, we came across some beautiful loose fresh cranberries from Oregon. 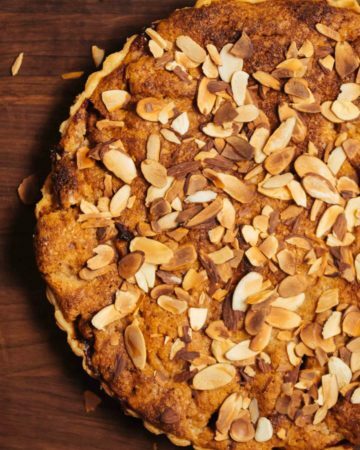 As we mentioned in our pumpkin pie post, when it comes to desserts, we tend towards tarts rather than pies. We both love sour cherry tarts, and thought a simple cranberry tart would be perfect for the holiday season. There are quite a few recipes online for cranberry tarts, but what we came up with is very easy. When you’re making Thanksgiving dinner for 20-30 people, there’s no need to overcomplicate things! One time and stress-saving tip we’ve learned: rolling out your pastry dough between two sheets of large parchment paper or plastic wrap makes it much easier to manage (and keeps your counter clean). Once you’ve rolled it to the desired thickness, lift off the top layer of parchment paper or plastic wrap and use the bottom layer to flip the dough into your tart pan. The filling for this tart is so simple: sugar, Cointreau, cranberries, and orange zest. Keep an eye on the cranberries as they cook down quickly. You’ll want to use a tart pan with a removable bottom to keep the beautiful edge of the crust. We love the way the color of the tart plays off the gorgeous tart platter from Hermès. Add a dusting of powdered sugar and dessert is served! 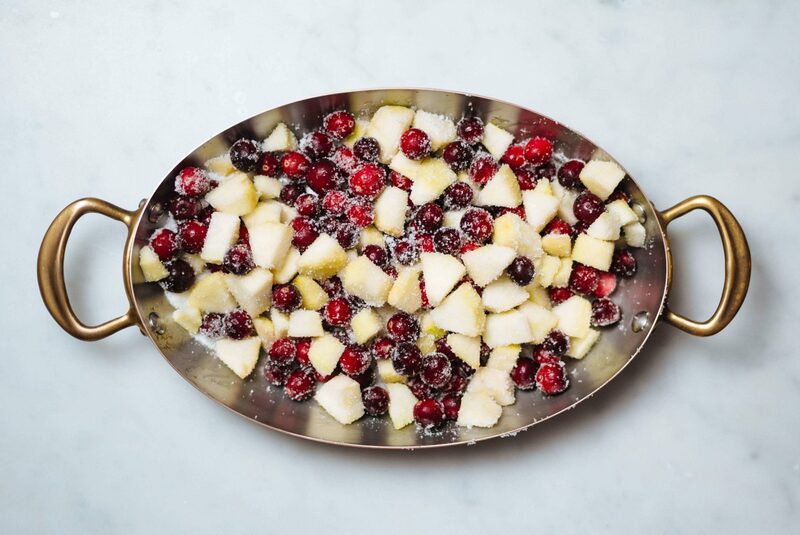 Serve with whipped cream or vanilla bean ice cream to cut the tartness of the cranberries. Press dough into the bottom and up the sides of the pan to fill all corners evenly. Cut off the excess hanging dough with a knife or fingers. Line the pastry dough with foil and add pie weights or beans to keep the crust from puffing up. Bake at 375 for around 20 minutes. While it is baking: Combine sugar, water, and Cointreau in a large saucepan. Bring to a simmer. Once all of the sugar has melted into the water, add the cranberries. Cook 5-10 minutes, until the cranberries reach desired consistency. 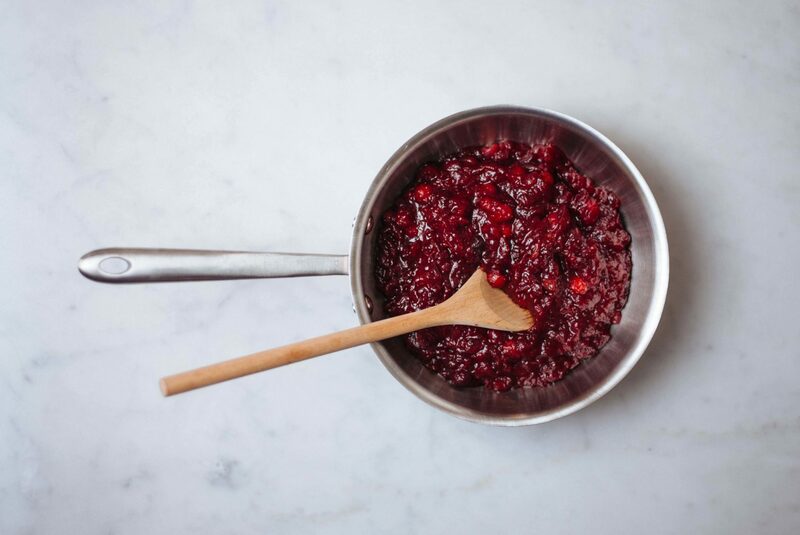 Remove cranberries with a slotted spoon or strainer and continue to simmer the syrup until it is very thick. The cranberries will continue to give off liquid as they cool. You can add this back to the pan. Once the syrup is reduced by about half, add the orange zest and remove from heat. After 20 minutes, remove the crust from the oven and uncover. Return to the oven for 5-10 minutes, or until golden brown. Return cranberries to saucepan to warm in the syrup, just until they are easy to spread. Pour filling into baked tart crust and let cool. When ready to serve, sprinkle with powdered sugar. Serve with whipped cream or vanilla ice cream.